We present a technique that uses images, videos and sensor data taken from first-person point-of-view devices to perform egocentric field-of-view (FOV) localization. 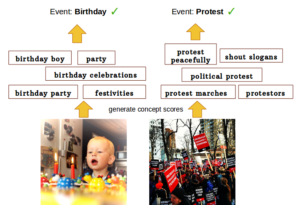 We define egocentric FOV localization as capturing the visual information from a person’s field-of-view in a given environment and transferring this information onto a reference corpus of images and videos of the same space, hence determining what a person is attending to. Our method matches images and video taken from the first-person perspective with the reference corpus and refines the results using the first-person’s head orientation information obtained using the device sensors. We demonstrate single and multi-user egocentric FOV localization in different indoor and outdoor environments with applications in augmented reality, event understanding and studying social interactions. We present an algorithm to estimate depth in dynamic video scenes.We present an algorithm to estimate depth in dynamic video scenes. We propose to learn and infer depth in videos from appearance, motion, occlusion boundaries, and geometric context of the scene. Using our method, depth can be estimated from unconstrained videos with no requirement of camera pose estimation, and with significant background/foreground motions. We start by decomposing a video into spatio-temporal regions. For each spatio-temporal region, we learn the relationship of depth to visual appearance, motion, and geometric classes. Then we infer the depth information of new scenes using piecewise planar parametrization estimated within a Markov random field (MRF) framework by combining appearance to depth learned mappings and occlusion boundary guided smoothness constraints. Subsequently, we perform temporal smoothing to obtain temporally consistent depth maps. 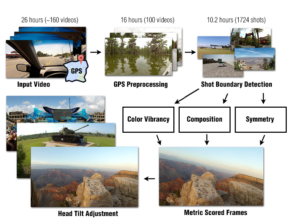 To evaluate our depth estimation algorithm, we provide a novel dataset with ground truth depth for outdoor video scenes. We present a thorough evaluation of our algorithm on our new dataset and the publicly available Make3d static image dataset. Welcome to Spring 2014 term. Happy 2014 to all. This term I am teaching CS 4464/6465 (Computational Journalism) and CS 4001 (Computerization and Society) at Georgia Tech. Following links provide more information on both these classes. CS 4464 / CS 6465 Computational Journalism: This class is aimed at understanding the computational and technological advancements in the area of journalism. Primary focus is on the study of technologies for developing new tools for (a) sense-making from diverse news information sources, (b) the impact of more and cheaper networked sensors (c) collaborative human models for information aggregation and sense-making, (d) mashups and the use of programming in journalism, (e) the impact of mobile computing and data gathering, (f) computational approaches to information quality, (g) data mining for personalization and aggregation, and (h) citizen journalism. CS 4001 Computerization and Society: Although Computing, Society and Professionalism is a required course for CS majors, it is not a typical computer science course. Rather than dealing with the technical content of computing, it addresses the effects of computing on individuals, organizations, and society, and on what your responsibilities are as a computing professional in light of those impacts. The topic is a very broad one and one that you will have to deal with almost every day of your professional life. The issues are sometimes as intellectually deep as some of the greatest philosophical writings in history – and sometimes as shallow as a report on the evening TV news. This course can do little more than introduce you to the topics, but, if successful, will change the way you view the technology with which you work. You will do a lot of reading, analyzing, and communicating (verbally and in writing) in this course. It will require your active participation throughout the semester and should be fun and enlightening.